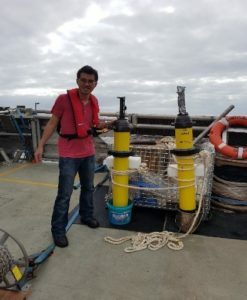 Dr Je-Yuan (Andy) Hsu, CSHOR Postdoctoral Fellow, preparing for Argo floats deployment from the chartered vessel, Limitless (Photo by Ryan Crossing 22 November 2018). The 2018–19 northern monsoon season is one of tardiest on record with the monsoon arriving later than ever. That is compounded by the uninterrupted heat stress, causing a tough 2019 for agricultural industries in WA’s north. Read the ABC Rural article about the unusually dry start to the wet season at this link. The Australian monsoon has shown some unusual variability in recent years and to predict its onset and strength is still a challenging task. This may be due to our lack of understanding of the coupled ocean-atmosphere processes associated with the Madden-Julian Oscillation (MJO) in the Maritime continent and in the eastern Indian Ocean warm pool to the north of Australia. The MJOs are week-long to monthly weather patterns that propagate eastward along the equator, and are sensitive to how the ocean and atmosphere exchange heat and water. The southward excursions of the MJO convections are often associated with the northern Australian monsoonal rainfalls. Simultaneous ocean and atmosphere observations off the northern-northwest coast of Australia have been scarce. A recent endeavour, funded by the Centre for Southern Hemisphere Oceans Research (CSHOR), a joint venture between CSIRO and Qingdao National Laboratory for Marine Science and Technology (QNLM), and the First Institute of Oceanography (FIO), the Ministry of Natural Resources, China, has been filling this knowledge gap. 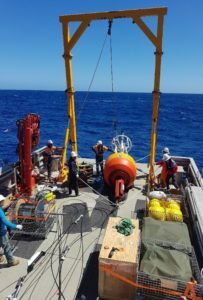 A team of scientists from CSIRO and FIO deployed a Meteorology and Ocean Profiling Buoy and an array of fast profiling Argo floats to provide a better understanding of the ocean-atmosphere exchanges during the monsoon onset and their underlying ocean dynamics (Photos from November 2018 voyage). FIO scientists (led by Dr Yongliang Duan) and CSIRO scientists on board the Limitless deploying the Meteorology and Ocean Profiling Buoy at the edge of the Australian EEZ (Photo by Yongliang Duan, 21 November 2018). The intense ocean and meteorology observations, as well as simulations using Australia’s seasonal forecast model, ACCESS (the Australian Community Climate Earth System Simulator), have suggested that diurnal ocean surface warming would increase the near surface ocean temperature on a multi-day time scale during the calm phase of the MJO. The increase of sea surface temperature (SST) will then lead to enhanced heat fluxes and moisture release from the ocean to the atmosphere. This would subsequently feed the convective phase of the MJO and lead to the onset of the Australian monsoon (Refer to the schematic below). Dr Ming Feng, CSHOR project leader, says that in the next phase of the project, scientists will use the ACCESS model to simulate the MJO evolutions during the field campaign period and to unveil the coupled ocean-atmosphere dynamics behind the monsoon onset and to evaluate the model performance in capturing these events. “A more ambitious step is to maintain the flux buoy observations at the critical location between Indonesia and Australia for the longer term, which has been strongly promoted by the international research and operational communities”, added Dr Weidong Yu, Senior Scientist from the FIO. The CSHOR team will join an RV Investigator cruise during the next Australian monsoon season, led by Dr Susan Wijffels, CSHOR Project Leader, Woods Hole Oceanographic Institution (WHOI) Senior Scientist and CSIRO Chief Scientist, to research the multiscale ocean and atmosphere processes off the northern Australian region. 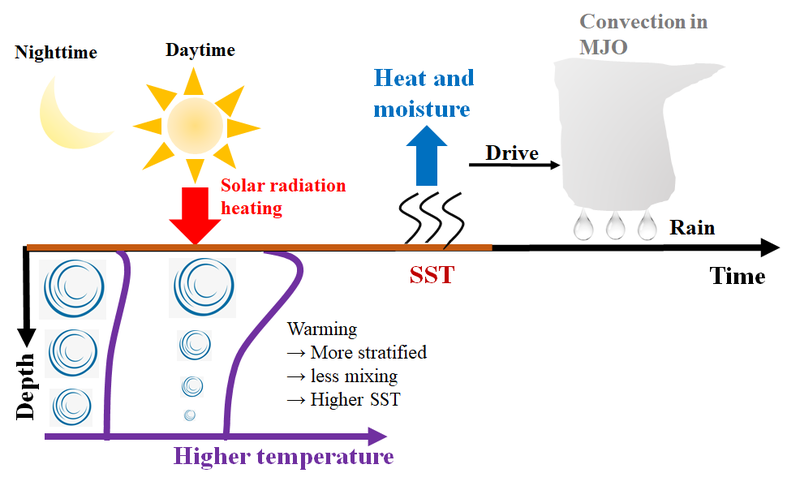 A schematic showing the diurnal and multi-day surface warming would lead to the deep convection of the MJO to the north of Australia (Courtesy Je-Yuan (Andy) Hsu).